The HVA Series is a miniature, bi-polar, zero-crossing high voltage amplifier capable of producing a high voltage up to ±6kV in response to a low voltage (0 to 5V) programming input. 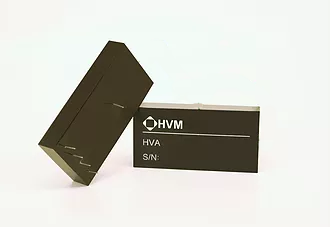 Designed for ease of use, the HVA Series contains a dual polarity high voltage generator and a high speed, high voltage amplifier in a space-saving (3.0”L x 1.5”W x 0.5”H) encapsulated package. The HVA05XX operates from a 5VDC input, while the HVA12XX operates from a 12VDC input. Output voltage is independent of input power voltage and is proportional to the programming voltage (0 to 5V produces negative full scale to positive full scale output) and features excellent linearity. The HVA Series also has an enable input that allows the user to disable the internal high voltage generator.